Revenge of the Indian Nations. 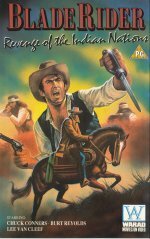 An oddity of a Western this one as it is comprised of three episodes from Chuck Connor's series "Branded". So although the story might a little awkward to follow it has appeal because of early appearances by stars that went on to greater things. Look out for Noah Beery, do you remember him from the Rockford Files?